At home, we had the aftermath of the attack by the white gang on the Asians playing football. The police confirmed they had stepped up their presence in the Daneshouse area whilst Councillor Les Harrison said Burnley was sitting on a powder keg if action wasn't taken to diffuse tensions. "From what I can gather there are two Asian gangs - the Jaggars and the Tigers - who go round in groups. There has been trouble between the two and also with local white youths. It all started as name calling and developed into fisticuffs and worse. "There has also been an element of abuse to some of the elderly residents which is quite disgusting. If it happened to a relative of mine, then I'm afraid to say that I would have been taking a bit of physical action. " Mr Harrison continued digging a big hole for himself and then ended by saying a public meeting would sort things out, presumably without him getting too physical. If that wasn't enough, there was a gun raid at the Parkhill petrol station on Padiham Road. It happened at 10:20 p.m. with one woman operating the station and she promptly handed over the money to the armed masked raider before pressing the panic button. Owner Peter Winston said: "She did the right thing. She was working under instructions and gave him the money without any fuss." The raider got away with just over £90. One poor Burnley man called Kevin (he didn't want his surname publicising) was distraught when his and his wife Vera found themselves separated by red tape after a whirlwind romance ended in marriage. Kevin had been looking for love via a 'Singles' magazine and found himself nothing but a few pen friends, four of them in the Soviet Union. He enjoyed the letters from one of them in particular, a lady from Leningrad by the name of Vera. The lady decided to visit him on a four week visa and they enjoyed each other's company so much (that's before the red tape arrived) that they got married before she had to return home. They were hoping some of that tape might be untangled by Christmas. Another poll tax evader was jailed and that meant no less than 25% of those jailed nationwide were from Burnley. Whilst with the court news a bit of advice. If you see a Peter Kay look-a-like shouting at you that you've not got your car lights on then take his advice and switch them on. One Burnley man didn't, was stopped by police and found to have been drinking. He was fined and banned from driving for 12 months. In local sport, the Lowerhouse cricket professional Manoj Prabhakar was unavailable for the day's game and Harry Brooks promised them one of the biggest names in the game as substitute. "We are determined to keep interest in the season alive and feel we owe it to our supporters to go for the best players available. I'm confident we can get Sachin Tendulkar to Lowerhouse but if not we will still be going for a top class performer." Lowerhouse were at home to Accrington, but for those who went to see the Little Master there was disappointment. The substitute professional turned out to be little known South African David Callaghan who had a disappointing day as Lowerhouse were beaten. Better days came to Lowerhouse some 14 years later in 2005 and there was a fantastic link between that year, when they lifted the Lancashire League title for the first time, and this weekend in 1991. The Craig Heaton Memorial Trophy, held for the first time in 1991 after Craig sadly passed away in 1990 at the age of 21, reached its climax with St. Theodore's School beating Habergham High School in the final. In the St. Ted's team were Joe Beneduce and Jonny Russell, so how appropriate that In 2005 Beneduce became the first ever Lowerhouse captain to lift the Lancashire League title and with Russell also in the side. 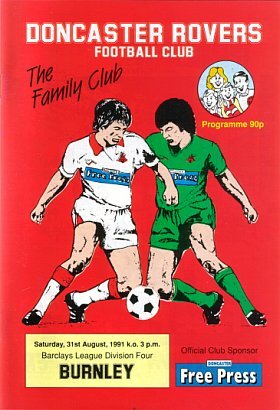 Football was the game though and Burnley were off to sunny Donny with Frank Casper naming both new recruits, Andy Marriott and Mark Yates in the side. The game was no more than a minute old when Roger Eli collected the ball just about on the half way line and out against the left touchline. He turned two men and went on a run. He looked as though he might go all the way but he was caught by Billy Whitehurst and that was a penalty. Referee David Shadwell had no hesitation and up stepped penalty expert Mike CONROY to give Burnley the lead as he hit is penalty past Doncaster Rovers goalkeeper Paul Crichton. Doncaster fought back though and grabbed an equaliser. A ball into our box broke of new goalkeeper Marriott and NOTEMAN finished. Marriott was unlucky but Doncaster were back in the game. The game changed Burnley's way just before half time. Whitehurst stumbled and in doing so dragged the ball back with his hands. He'd already been booked and he didn't wait to see the card as he walked off with Burnley assistant Jimmy Mullen remonstrating. Burnley were now favourites, but with 20 minutes gone in the second half the score was still 1-1. Then, manager Frank Casper made two substitutions in six minutes that helped change the game. Left back Ian Bray was replaced by Steve Harper in 65 minutes and on 71 minutes fellow full back Paul France made way for David Hamilton. Both caused Doncaster problems. Almost immediately after the second change we won a free kick on the right. Hamilton took it and found Eli to head it on for HARPER who was in yards of space on the left hand side of the box. It was easy for Harper as Burnley went back in front. It was Hamilton again on the ball, this time playing a superb through ball for new boy YATES to outstrip everyone and run on goal. He was some 40-yards from goal and as he moved forward he was saw the oncoming Crichton. The £50,000 midfielder made no mistake giving the goalkeeper no chance at all to finish so coolly. It looked all over then, and it was with five minutes to go as the Burnley fans, packed in and caged behind Marriott's goal, celebrated number four. From a throw in Deary, again in superb form in the midfield, nudged it to Eli who flicked it into a crowd of players. It was CONROY who got there first to get it past Brendan Ormsby on the line to complete the scoring and the rout. 4-1. Doncaster Rovers: Paul Crichton, Mark Rankine, Dylan Kerr (Tommy Tynan 79), Craig Bennett, Brendan Ormsby, Jack Ashurst, Jon Cullen, Eddie Gormley, John Muir, Billy Whitehurst, Kevin Noteman. Sub not used: Brian Rowe. Burnley: Andy Marriott, Paul France (David Hamilton 71), Ian Bray (Steve Harper 65), Steve Davis, John Pender, Mark Monington, Mark Yates, John Deary, John Francis, Mike Conroy, Roger Eli. We were the highest scorers on the day and the result took us to third in the table, above Hereford United, Rotherham United and Barnet on goal difference, all on 6 points. Blackpool led the league with three wins out of three and Crewe were second with 7 points. Poor Doncaster were without a point and only off the bottom because they'd scored more goals than Maidstone United. 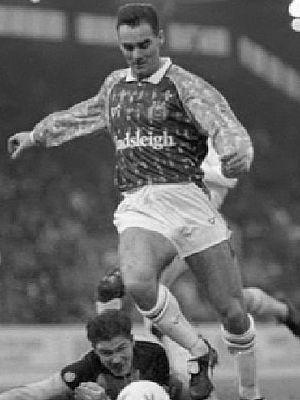 Next up for Burnley were Chesterfield who had won one and lost one of two home games but were still to play away from home.